The Defence Research and Development Organisation (DRDO) continued with its successful run of missions this year, when it successfully conducted a ‘textbook precision’ launch of the home-grown subsonic cruise missile Nirbhay on Monday. Officials now confirm that the developmental phase trials of the Nirbhay missile are over, having completed all mission objectives. “The next set of trials will be as per the user requirements. We will be also testing the missile with an indigenously-developed small turbofan engine (STFE) in future,” an official said. DRDO stated that the Nirbhay missile was launched from the Integrated Test Range in Chandipur, Odisha at 11:39am on Monday. 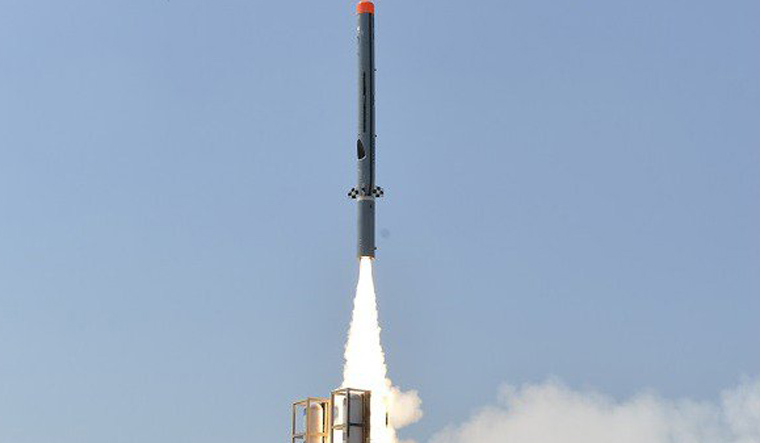 This was the sixth launch of the Nirbhay (NGL-06) and was aimed at testing the reliability of the ‘boost phase’ and ‘cruise phase’ using waypoint navigation at very low altitudes. The Nirbhay missile is said to have demonstrated its sea-skimming capabilities while cruising at very-low altitudes over the sea. “It was an excellent launch. This is the first time ever an indigenously-developed missile cruised at 5-metre altitude,” an official confirmed to onmanorama. During Monday’s mission, the Nirbhay missile covered waypoints as low as 5 metres to a maximum of 2.5km. DRDO said the entire flight was fully tracked by a chain of electro-optical tracking systems, radars and ground telemetry systems deployed all along the sea coast. Monday’s mission was completed within 43 minutes, covering 15 waypoints. In its terminal phase, the Nirbhay missile is said to have travelled at a sustained altitude of 5 meters, which lasted about 10 minutes. “This is a very significant achievement that gives huge advantage for the weapon system,” says an official. The missile has a range in excess of 1,000km and Monday’s mission saw it being tested in a low-altitude role, with the target being within the 650-700km range. Monday’s mission saw an Su-30MKI of Indian Air Force doing the chase duties, tracking the missile during its cruise phase. “The Su-30 MKI was chasing the missile equally at a low altitude. Since the Sukhoi is a long-endurance platform, it is the first choice during such missions,” an official said. DRDO had in the past used Jaguars, Mirages and Su-30MKIs for chase duties. Normally, to enable smooth capture of video footage of a missile in motion, the pilots are briefed in advance about the launch time, duration, flightpath, speed and other parameters. Nirbhay’s first launch was a failure owing to the output from one of the sensors of the navigation system getting frozen for a brief period. Taking range safety in account, the mission was aborted by destroying the missile after 15 minutes of flight. The next launch was a major success and the Nirbhay missile met all mission objectives after travelling about 72 minutes and covering 1,050km. The missile failed in the third trial after a malfunction of the control system during the flight. DRDO’s quality checks came under severe criticism following this incident. The fourth flight too flopped after the wing deployment was delayed for few seconds, taking the missile out of control. The missile was remotely destroyed. In the fifth test, the Nirbhay missile was successful and met all expectations of its makers. The near-50-minute flight saw the missile travelling close to 650km. And, Monday’s success during the sixth flight is sure to up the confidence of scientists to work on different variants of the missile in the future. The missile makers at Aeronautical Development Establishment (ADE), a DRDO laboratory based out of Bengaluru, too, were in a celebration mood soon after the news of the successful Nirbhay mission trickled in. “Perhaps, it’s a perfect farewell to M.V.K.V. Prasad (ADE director), who is retiring at the end of this month,” a scientist said.